Not many of us, but quite a few of them. Us? Nigel, Todd, JR. Like I said, not too many of us. It was Thursday so it was up through the park, with Nigel saying he felt really bad, which meant I was just barely able to hold onto his wheel. Todd had ridden on ahead, but Nigel, JR & I rode up together. We passed two cyclists on the way up Kings, then came across a large number congregated at the top of the hill. 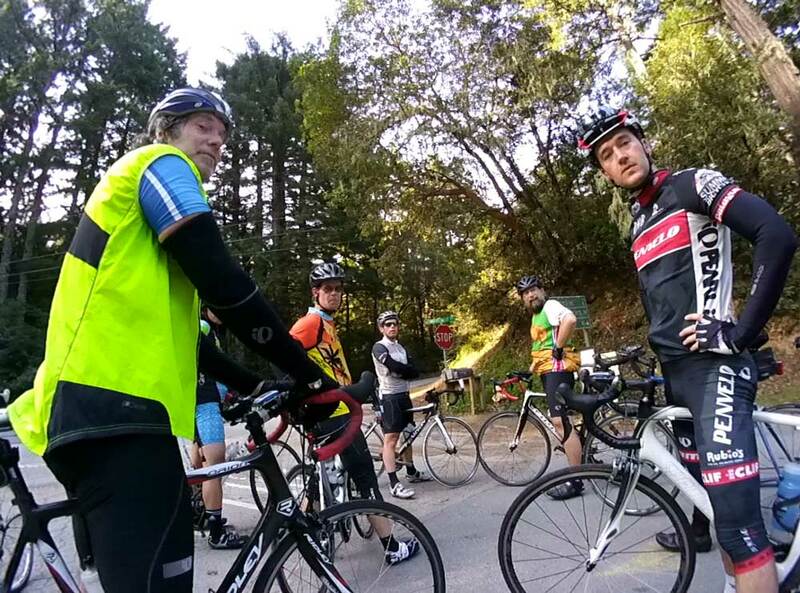 I rode over and engaged the group, asking who they were (Google employees) and discovered I had an instant “in” with this group. My bike’s “dashboard” with its video camera mounted up front. What, someone with something not a GoPro? They wanted to know what type it was, how well it worked, and then Nigel started talking about Google Glass (and not in a complimentary way)… but for a brief moment, I had the attention of some small piece of the Google brain trust. And then it was time to continue riding, because that’s what we do on Tuesday & Thursday mornings. We have a schedule to keep with roads both old & familiar.